There are a lot of choices when it comes to getting a new website and many times a small business with a tight budget will opt for a do-it-yourself website or a template instead of getting a professional website. A professionally designed website is almost always a better choice than DIY. Getting a site that costs a little more will bring in rewards not available with those DIY sites. Not only will a professional website look and feel customized for your business, but it also comes with the team of knowledgeable people you will need to keep it updated, serviced and running smoothly. What kind of impression does your website make when it looks like you made it yourself? What message you sending to your customers? 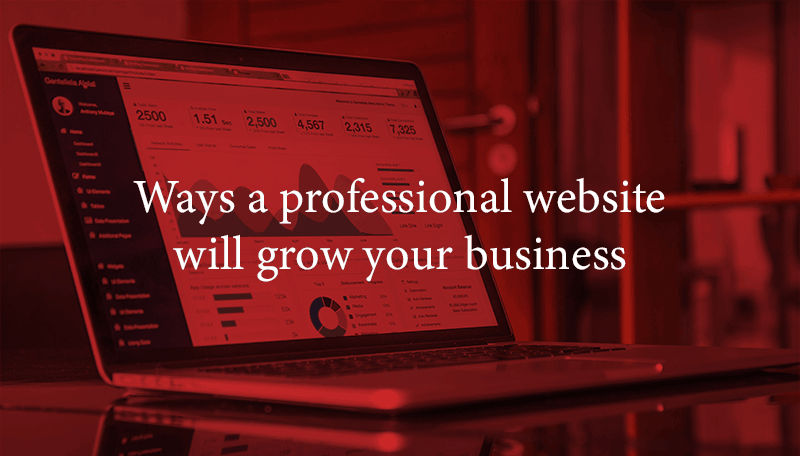 That message may be that your business can’t afford to have a professional website. That you aren’t invested in your business enough to invest in your online presence. That you don’t believe in your services or products enough to showcase them at their best. Having a professional website provides detailed information about your business and lets your potential clients know your business is stable. You can provide a clear picture of your business and the vision you share. If your website looks high end, then your business looks high end too. One of the biggest mistakes I see businesses make are ignoring their website in favor of other areas of marketing, such as billboard or flyers. And while using traditional marketing isn’t a bad idea, approximately 80% of customers research a business online before making the first contact. If they get to your website and it looks dated or like you haven’t spent much time, effort or money on it, what impression does that make? This is particularly important if you work an industry that provides pretty expensive services, such as home remodeling, contracting, doctors and attorneys. Having an unprofessional website will not establish trust between your potential customer and you. If your website looks bad, they may leave your website and go to the next in the list. If your competitor’s website is better, then you may have lost a sale. One of the biggest benefits of having a professionally designed website is that professionals understand how people use websites and can tailor your website to your target audience. A DIYer is likely to think of their website as an online business card rather than a marketing tool. They can import a template, upload a few pictures, write a brief bio and include their phone number and they are done. But a professional knows better. They know how to leverage their knowledge of website use along with your expert knowledge of your industry to create a website that is not only attraction and functional, but one that converts. A professional website will be working for you when you’re out working for your customers. And that’s the real goal of any online campaign. Ask yourself this – how many customers would you have to get as a result of having a great new website to make the investment worthwhile? How many would you need in one year? And how many more each year would you need to make the website pay for itself? And in three years, will that investment have made you a profit? If your DIY website can’t do that, then you may be wasting your own time doing your website which could better be spent running your business. You’re an expert at your business, let us be the experts at your website.